For many people, food is a source of joy—and one that can help them live life at its fullest. One of the best ways to infuse flavor into your diet and be sure you’re getting the nutrients you need? Fresh fruits and veggies! Spring is right around the corner and that means the produce you see in the grocery store and at the farmers market will be changing. Choosing the right produce is an important part of healthy eating for seniors, and one that the experts at Senior LIFE can help you with! Let’s take a look at a few senior nutrition tips, starting with what a healthy diet includes. Our nutrition needs change as we get older. Senior LIFE offers nutritional counseling designed to help overcome challenges and ensure healthy eating. Ensuring that your body’s nutritional needs are met is one of the most important parts of living a healthy lifestyle. Eating a balanced diet plays a key role in maintaining good health. In order to begin the journey toward healthy elderly nutrition, you must first know what a healthy diet consists of. You might be familiar with the food pyramid, but the USDA offers an even easier way to understand the nutritional impact of your foods. The image below is called MyPlate, and it’s a great reference when determining how much to eat of what foods. 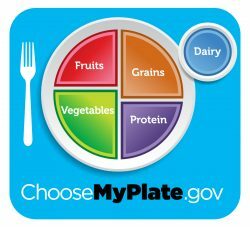 MyPlate recommends filling half of a plate with fruits and vegetables and the other half with whole grains and lean proteins, like chicken or fish. A small amount of healthy fats, like those found in olive oil or avocado, along with dairy, are also part of a healthy diet. Seniors are often challenged by diet and nutrition, because dietary needs change as we age. It can sometimes be difficult to incorporate all the nutrients seniors need into an everyday diet. One way to make food more inviting and palatable is to include fruits and vegetables that are fresh and in-season. The spring is an especially good time to try new types of produce! 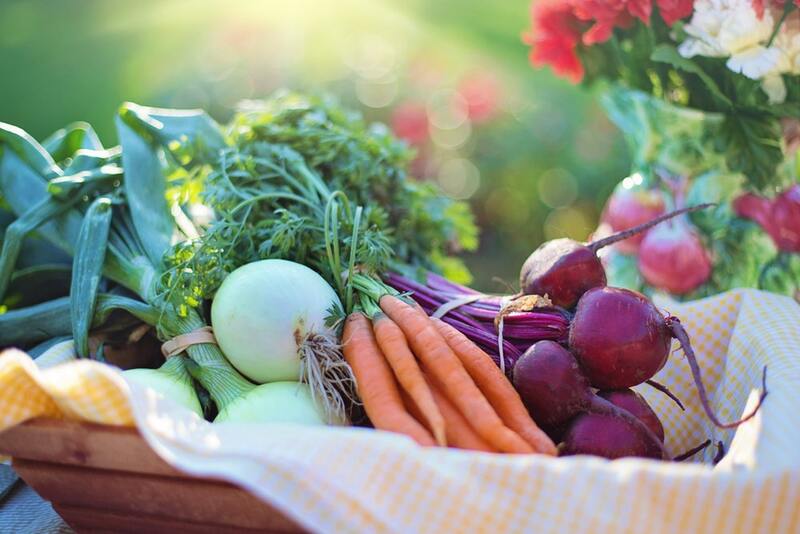 Eating a variety of fruits and vegetables is one easy way to make sure you or your loved one are getting the nutrients you need through your diet. Grapefruit is an excellent source of vitamin A, vitamin C, pantothenic acid, copper, dietary fiber, potassium, biotin, and vitamin B1. Cabbage has high levels of vitamin C, folic acid, calcium, potassium, and fiber. Peas have lots of protein, B vitamins, vitamins C and A, manganese, iron, potassium, and lutein. Shallots are a wonderful source of potassium, vitamin B6, manganese, and folic acid. Eggplant is high in fiber, potassium, manganese, and vitamin B1. Strawberries are an excellent source of vitamin C, manganese, folate, and potassium. Peppers have lots of Beta-carotene, vitamins B6, C, and A, and potassium. Carrots are rich in Beta-carotene, vitamins A and K, and potassium. Check out this list for even more in-season fruits and veggies to add into your diet! At Senior LIFE, we know that the nutritional needs for older adults differ from those at other stages of life. Seniors face unique challenges when it comes to eating the right foods and enough of them. That’s why Senior LIFE offers nutritional counseling to help seniors overcome those challenges and ensure healthy eating for seniors. Our registered dietitian can also assist with grocery shopping, meal preparation, and providing home-delivered meals to those in need. Nutritional counseling is only one of the countless services that Senior LIFE members have access to. Senior LIFE provides all health care and personal support services designed to keep seniors independent and healthy. Find the location nearest to you.